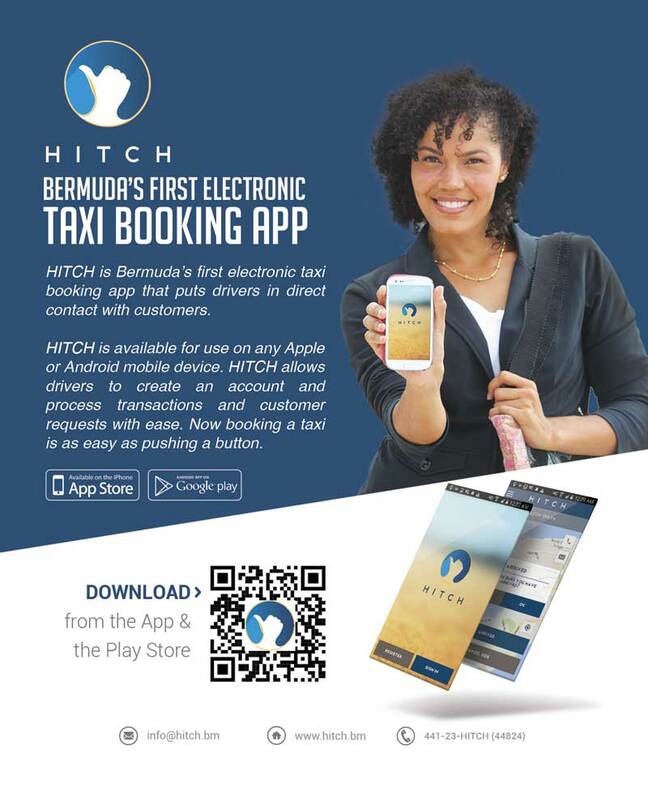 The company said, “HITCH is Bermuda’s first prearranged taxi booking app. 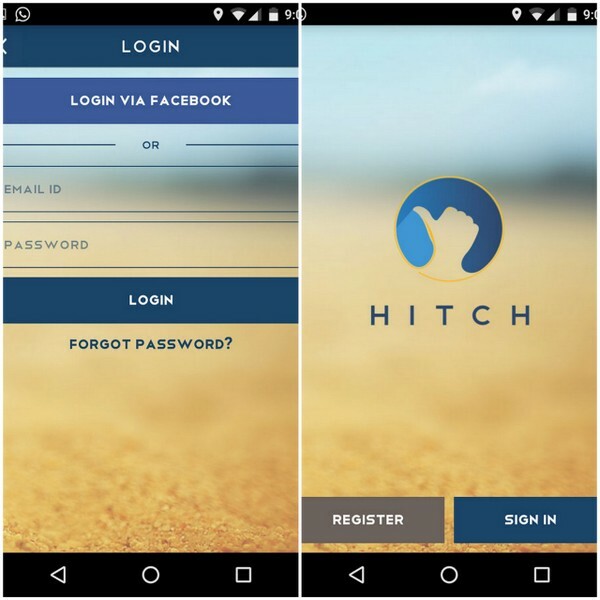 HITCH puts passengers in direct contact with drivers and allows for rides to be booked and transactions processed electronically, making travelling around the island even easier. “Customers can register easily by downloading the app and creating an account. Accounts are securely connected to a valid debit or credit card at registration and all bookings with HITCH drivers are charged directly, completely eliminating the need for cash when taking a taxi. “The app allows you to view all available vehicles in the area and gives you an estimated time of arrival, a fare estimation and even allows for you to track your drivers progress as they make their way to you once they confirm the booking. “Taking taxis also becomes more secure for both drivers and passengers as information on both driver and passenger are exchanged in preparation for the ride. 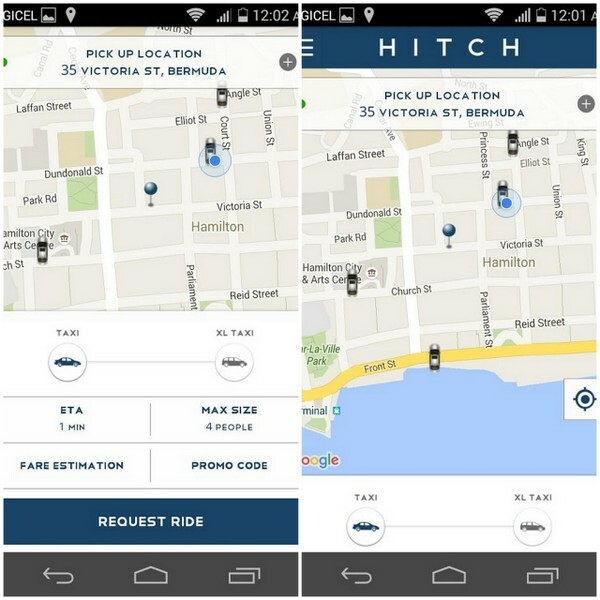 When asked if it is similar to the popular “Uber” app in the USA, the company explained that while the concept is similar, it is different in that Uber has an open driver policy, while HITCH will only approve licensed taxi drivers with access to a licensed taxi to use the app as drivers in accordance with Bermuda law. The passenger app is presently available in the Google Play Store for android devices [the Play Store link for the app for licenced taxi drivers is here], with the iPhone version set to launch later this month. takes far too long for cab drivers to pick you up. you call back 30 minutes later to find out they dropped the call and havent issued another. on the brightside, the long wait gives you more time to drink tea! Such a great idea, and it’s always great to see Bermudian entrepreneurs at work! All the best to the team behind this app. I will be using this in the future for sure. This could fix that. If government were to partner with the makers of this app to pull statistics and reports it would be far easier to track who is available, what rides they pickup and what rides they refuse to get and how often. Government needs to be a regulator and facilitator though I’m sure they’ll claim there’s no need for this as they’ve made “significant progress” on their own solution. Hope it all goes without a H I T C H! Recently, I had 3 tourist friends up at Dockyard. We played fun golf, then had dinner at The Frog and Onion and then had a late drink at the Pirate ship. We called a taxi…waited for 45 mins and called the BTA taxi company back. The operator was quite obviously apologetic but said no taxi has responded to the call. She had tried and tried on our behalf. The issue was that the taxis don’t want to drive all the way to Dockyard as their fare may have left by the time they get there. Quite understandable really. So, it needs to be solved. We all hear stories of tourists and locals stranded in Dockyard. It took us almost 2 hours to get a cab. Suggest we implement a system whereby the passenger actually pays the taxi all the way up to collect the passenger and to wherever he or she wishes to travel. Actually take the credit card number and let the passenger know that he is on the way and they are being billed. It will only take 15 or 20 mins then for a taxi to come from Warwick or Southampton. The taxi will be happy as it will be a large fare. The passenger wont be marooned in Dockyard. Everyone wins. Currently its a complete disaster and we all know it but have done nothing about it. We seem to move at the pace of molasses on so many fronts. Transportation is simply one of them. Really? Double pay for the job taxis are supposed to be doing in the first place? You’ll quickly have taxi drivers driving from St. David’s to Somerset to get their fares. I’d prefer to see us properly regulate taxi drivers. Do random spot checks and fine drivers who refuse fares. Better yet, partner with the makers of this app and track it using reporting an statistics. If it works like e uber, it solves this problem. Once you book a car, you’re on the hook to pay for it,, as long as the taxi turns up. so the taxi would know it wouldn’t be a waste of time going to get you. Have we finally admitted that Ewart’s GPS was a waste of time and money? No, the taxi drivers refused to use it. GPS works well. I used a shuttle to BWI early this week. 1 hour ride. We arrived early at pickup point. The shuttle arrived early too. We were the only passengers getting on so off we went 15 minutes early. Not 10 minutes into the trip the driver gets a call. Did he remember to pick us up the dispatcher wants to know? The van is GPS equipped & the dispatcher knows precisely where it is past our pickup point. Nothing wrong with GPS. It is a great tool. Another brilliant Idea to get our tourist transportation as well as our local population on the move more quickly.Quodos to the entrepeneur and great relief to the travelling Public. Great idea. But can someone create an app to adjust bad attitudes. Because out taxi drivers have bad attitudes and always feel they’re doing us a favor. Finally! HITCH is a luxury that many Canadians are used to. What I love about this app is not only the convenience it provides BUT that it is a home grown business. 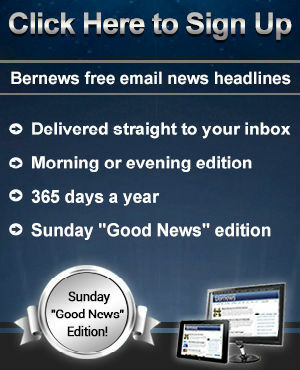 It is inspiring to see Bermudian entrepreneurs filling a niche. Bravo! I’m thinking this would be great for my kids. They could always hail a cab to get home in a pinch. Does it need data or just GPS and text? How does the app make money for it’s designers? Will it result in more expensive taxi rides? Do the taxis using telephone dispatchers cost more? Don’t the dispatchers work for the taxi company though? I just wondered how the app would generate income, that’s all. Great idea. Unfortunately it won’t improve the reliability of the taxis themselves. The industry is broken, and all the apps in the world won’t fix it. The taxi operators have to get off their behinds and show up. All you have to do is show up. Great app I have been using it works great. I hope all the taxi Drivers and customers get on board. How much is added to the fare? The ap is free, someone making money. Have to think the metered rate is no longer what I pay? It’s 15% grats. which worked out to be $17 fare instead of $15 fare. The driver actually ran his regular meter to show me the difference. I didn’t mind considering I always tip the good drivers anyway. So.. Hailo, then? Totally open to pre-paying for the ride if it guarantees a taxi. Went to download and install this app from the Play Store but stopped when I saw I saw the app permissions. Why does this app need access to my photos, media and files? Access to SMS? WiFi connection information? And Device ID and call information? I am not going to give this app blanket permission to access information on my phone that it has no need to access. Fix this! I got through to the website hitch DOT bm no problem. Also I had an issue with the app and emailed the address on the app page and got a response in 10 minutes. Why does this app need access to my photos, media and files? HITCH allows users to change their profile picture in the app. In order to do this we need access to your photos. Additionally, the mapping libraries in the app use these permissions to allow map data to be saved to your phone’s external storage, like SD cards. By saving map data locally, your phone doesn’t need to re-download the same map data every time you use the app. Similar to Whatsapp, when you sign up for Hitch App, we send a 4-digit verification code, via SMS, to the mobile number that you provided. This permission allows the app to look for that incoming SMS message and automatically verify that we have your correct mobile number. The window of time during which the app looks for that incoming SMS is limited to 60 minutes. Hitch App only uses this permission to search for the verification message that we send. We do not send to our servers or save the content of any messages other than the verification message. Device ID and call information? If you have any additional questions feel free to email us at support at hitch dot bm and we will be happy to help. We will also add the permissions information to our Google Play site. Finally, they will be available on our full website at our official launch. Thank you for trying HITCH! The present taxi companies may lose some business from Hitch’s competition, thus may need to up their business methods to keep drivers working through them. Would Hitch then venture to the Mini bus services next or already they being talked too.